During the night the clouds have been vanquished by a mass of high pressure that leaves the morning sky clear and vivid, the sunrise painting the atmosphere with the glowing pastel colors of dawn. The dogs and I hike up to Lujan Pass where the headwaters of Spanish Creek are located. 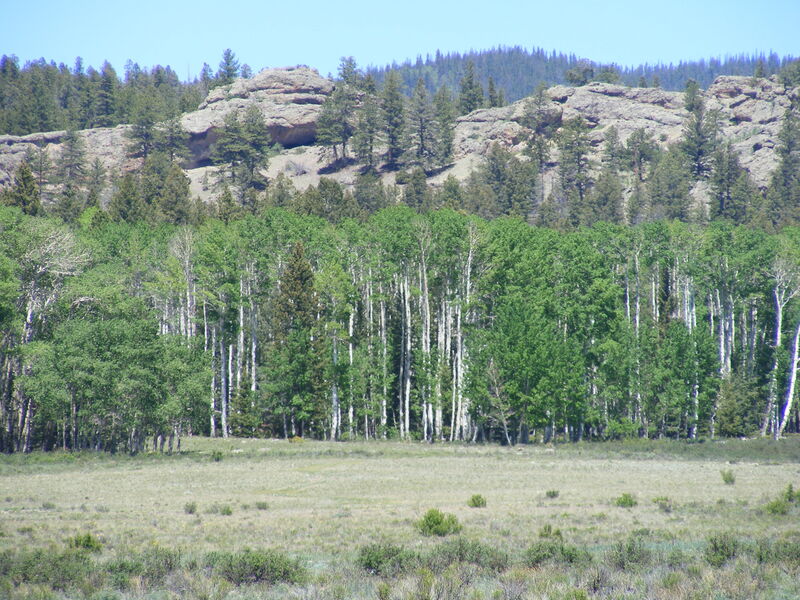 The Cochetopa Hills are the lowest point of the Continental Divide in Colorado, and the high ridge is covered in thick spruce and fir forest rather than the alpine tundra found along the Great Divide elsewhere in the state. The new shoes, pinching and blistering my feet, create excruciating pain and every step is near agony. On top of that, the primary joint of my big toe is stiff and swollen, but with some massage it is tolerable. The hike to the pass is still enjoyable, passing through a thick aspen grove along the creek. The view from the pass is expansive, and the views stretch out to the east so that I can see the long ridge of the Sangre de Cristo Range. The views from the pass to the west end abruptly at a ridge about a half a mile away, swathed in thick forest. The meadows are coated in a white frost, heavy for June. With the sun’s warmth, the frost won’t last long and is wont to sublimate as per the daily ritual. We return to camp, past a fellow who is packing up his camper. He is a seeker of solitude, as well as I, and we are both surprised to see the other; we have a nice chat, both reveling in the beauty and loneliness of the surrounding mountains. Camp is soon broken down and the shepherds and I return to the car but not before making a short side excursion. There is a small crack in the canyon wall, obscured by trees and rock such that I barely make its notice. We go up and sit for some minutes, a nice grove tucked out of the way. The hike isn’t long, but my feet are happy for the rest. The car is only a half mile or so further, and my feet and I are relieved to get to it.